Las Vegas is a betting town. So it appears fitting that Tony Hsieh would place the highest stakes of his entrepreneurial career on a city that rolls out the red carpet for risk-takers. As part of a $350 million urban experiment that began in 2011, the Zappos CEO wants to transform downtown Las Vegas into a thriving, culture-rich community led by creative thinkers and bound by common passions. The five-year plan places entrepreneurs at the core, with an emphasis on the arts, music, fashion and technology, as well as education and urban development. Hsieh's personal fortune is funding most of the project and there are a handful of individual investors. A sizeable chunk of the investment, $100 million, will be split evenly among tech startups and small businesses. Education initiatives are being allotted $50 million, while the remaining $200 million is being spent on real estate, from building and land acquisition to residential housing. In this series, we take you inside the project for a first-hand look at a city in the process of reinvention. When Tony Hsieh is asked about his $350 million urban experiment to revitalize downtown Las Vegas, the conversation almost always includes an encouraging nudge to see it for yourself. As the Zappos CEO moves the company's headquarters from Henderson, Nev., to the old City Hall building in downtown Las Vegas this fall, he plans to create an "energetic environment" for work and play -- one that he believes could help Zappos and the entire city flourish. So I spent a few days in downtown Las Vegas to view the process firsthand. Here are highlights from my recent trip. 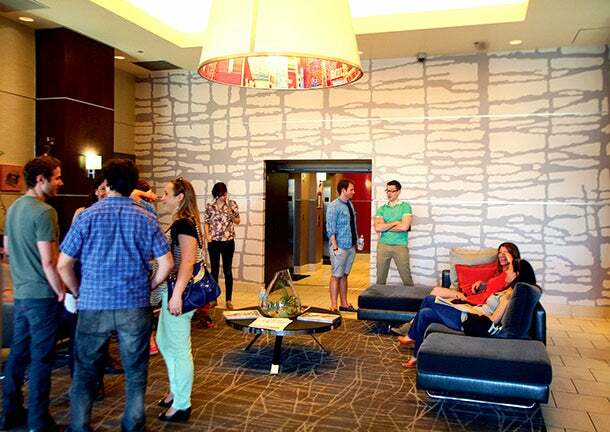 I check into the Ogden, a luxury high-rise condominium in the city's downtown. Hsieh lives here and rents about 60 furnished apartments that he sets aside for visitors of the Downtown Project. Whether they are community leaders from other cities or startups that Hsieh hopes will relocate here, invited guests stay at no charge as long they give back to the community in some way, through talks, mentoring or participating in local activities. As per Entrepreneur.com's policy, we paid a standard hotel rate for my stay. Guests of the Downtown Project meet in the Ogden lobby for a tour. Inside the apartment, you can't miss the four books with a "Compliments of the Downtown Project" sticker splayed on the coffee table. The recommended reading: Delivering Happiness by Hsieh (Business Plus, 2010), Zappos Culture Book (2011), Renegades Write the Rules by Amy Jo Martin (Jossey-Bass, 2012), and Triumph of the City by Ed Glaeser (Penguin Press, 2011). Hsieh says Glaeser's book has guided much of the thinking behind the Downtown Project. I head downstairs to the Ogden lobby and join a group of Zappos visitors boarding the Delivering Happiness bus, named after Hsieh's popular book, to attend the company's quarterly all-hands meeting at the Smith Center, a performing arts venue in downtown Las Vegas. The atmosphere in the amphitheater is a far cry from any traditional company-wide gathering. With a mix of rap and indie music to rev up the crowd during breaks, Zappos employees take the stage to deliver corporate updates, some sharing information in the form of comedic skits. The three-hour meeting is interspersed with inspirational speakers, including peak performance strategist Tony Robbins, who draw standing ovations from many of the company's nearly 1,500 employees. 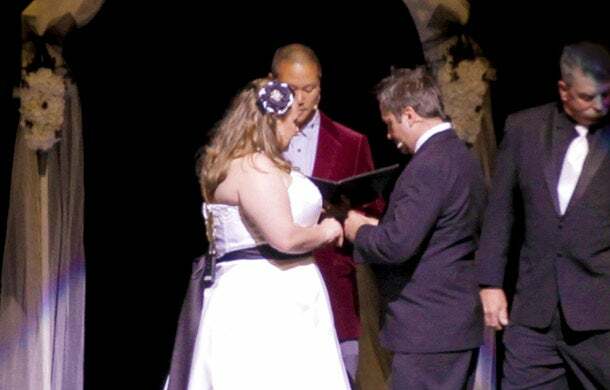 Zappos employee Heather Wetsel got married at the company's all-hands meeting. Tony Hsieh served as the wedding's officiator. The day's scene-stealing moment has nothing to do with business, though it appears to underscore the company's tight-knit culture: Zappos employee Heather Wetsel surprises the crowd by getting married at the meeting. On cue, the Bruno Mars hit song "Marry You" is piped through the speakers just before the ceremony begins on stage. Hsieh, donning a burgundy velvet jacket and sneakers, serves as the wedding's officiator. It’s a poignant moment that elicits cheers and tears from Wetsel's colleagues and others in the audience. Wetsel, who works in the company's customer-service division, says it was the only way to make sure her entire Zappos "family" could be part of her special day. After the meeting, hundreds of employees and visitors spill out of the amphitheater into Symphony Park for a company-wide happy hour. There are makeshift bars under canopies, barrels filled with sodas and bottled water, and food trucks ready to serve up a late lunch. A DJ sets up at the front of the park, and within an hour, there are scores of employees and visitors gathering in the open lawn for line dances. Among the most popular: the Cupid Shuffle. A two-block walk from the Ogden is the Beat Coffeehouse, where tonight the focus is on tech. 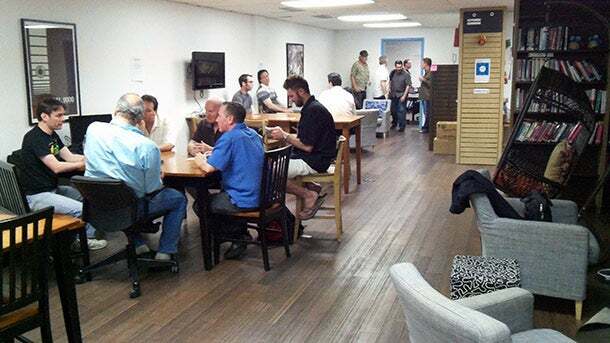 Every Thursday evening, developers gather here for the Tech Jelly, a casual co-working event where anyone can stop in to work on a project or even search for co-founders to join their startup. Inside the Tech Jelly on the upper level of the Beat Coffeehouse. While Jelly co-working events have been around since 2006 and now take place in more than 100 cities, this one began just two years ago in downtown Las Vegas. It started as a bi-weekly gathering of a handful of people hanging out at the coffee shop tables. Today, it's held in the "usr/lib" Work Lounge, a 1,500-square-foot space on the upper level of the coffeehouse. The space is managed by Work in Progress, the Downtown Project's own network of co-working venues. The Downtown Project's focus on technology and co-working makes the Tech Jelly an ideal catalyst for its mission. When I walk in, some people are huddled together, others work alone on laptops, and a breakout session is about to start in the back room. A woman working on a solar energy project is setting up for a presentation and hoping for feedback. The room is filled with a few dozen people ready to chime in. Anyone can sign up to speak, usually up to 15 minutes, on topics of interest to the entrepreneurial or startup community. While there is some semblance of structure, the Jelly is mostly informal, which is part of the draw. About 150 to 200 people will come through in an average week, according to Rick Duggan, director of website systems at Zappos, who volunteers to run the Tech Jelly on his personal time. There are no tickets to buy and no need to register in advance. "If you decide at 6:30 that 'Hey, I'm going to the Jelly tonight,' great," Duggan says, "come on down." Back in the lobby of the Ogden, I meet up with more than a dozen visitors, as we're all signed up for an overview of the Downtown Project. One of the highlights is a tour of Hsieh's apartment, which is three units combined but with the walls knocked down. When you first step in, you can't help but be visually charged by the primary colors -- entire walls are boldly painted in orange, blue and green. Krissee Danger leads the Downtown Project tour, starting with Tony Hsieh's apartment. The apartment is an eclectic mix of jungle (the walls of one room are covered in plants), play area (there are school-type desks with wheels that visitors are encouraged to scoot around in) and classroom (the living room is decorated with architectural renderings and colorful illustrations of what's to come with the Downtown project). Another wall is covered in sticky notes, each one containing a scribbled small-business idea -- dance studio, indie record store, movie theater and many more --submitted by members of the community. The wall of ideas serves as a visual reminder of the project's focus on entrepreneurs. 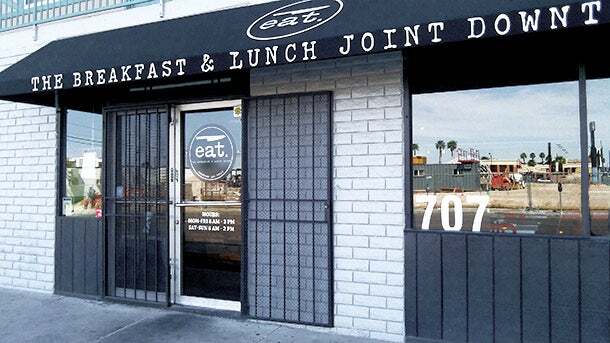 Eat restaurant is the project's first and most successful small-business investment. I miss the lunch rush, but there are still several lingering diners when I walk into Eat restaurant, the project's first and most successful small-business investment thus far. I'm here with Don Welch, who is managing the $50 million small-business development fund. Las Vegas chef Natalie Young started the comfort-food restaurant, which serves only breakfast and lunch, and we happen to stop in during one of her few short breaks. Young has a cheerful personality that quickly turns to no-nonsense when she's in the kitchen -- or talking business. The Downtown Project provided $225,000 in financing for the restaurant in exchange for 50 percent equity, she says. "It has been profitable since day one," adds Welch, a former Wall Streeter who worked in equity derivative sales at Citigroup before joining the Downtown Project in 2011. For the past year and a half, Welch and his team have fielded some 1,600 requests for funding from small businesses in downtown Las Vegas. Next stop, a few blocks away, is the construction site of the project's much-anticipated Shipping Container Park, which is expected to open in early October. The outdoor shopping-and-dining marketplace will house between 25 and 30 small businesses operating out of converted shipping containers. Big Ern's BBQ will move from this construction zone into the Shipping Container Park, when it opens in October. Big Ern's BBQ will be one of them. 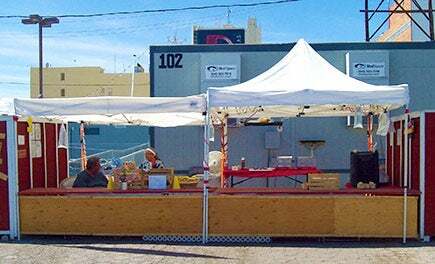 It got a head start last fall by opening as a simple lunch stand in the construction zone, directly across from the Container Park site. When I meet owner Ernie Loya, he's excited. As soon as he sees Welch, Loya shows him a new magazine review that lauds his BBQ rubs and sauces. After congratulating him, Welch turns to me and says, "By the time the Shipping Container Park does open, he's going to have a brand that everybody recognizes, so that's the real win." To date, 17 local businesses have received investments from the small-business fund, another 14 have been approved, and the number is expected to total 60 by year's end. "It's going to ramp up very quickly," says Welch, who also acknowledges that operating at such a quick pace has, on occasion, brought its own set of challenges. "It's very easy to say go, go, go, without really sitting down and thinking about it," he says. "For example, we were going to put a dog park in one spot, and we got pretty much to the point of submittal to the city. We were so focused on that one spot but we needed to take a step back and see if it was the right size." As it turned out, the lot right next to it was twice the size and a much better spot. Welch ultimately switched gears and opted for that one instead. "So we wasted some time, paperwork and probably a little money, too," he says, "but in the end we got to the right answer." 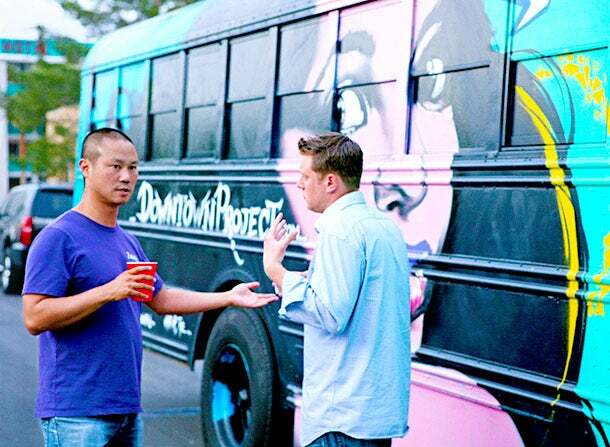 Zappos CEO Tony Hsieh and Don Welch, who leads the small-business fund, chat before boarding the bus to "First Friday." I'm on the lookout for the man in the Zappos T-shirt. Before meeting up with Tony Hsieh at a mixer, I was told his personal dress code rarely strays from a company T-shirt and jeans. He'd rather blend in a crowd than stand out. I find him saying hello to friends, trading hugs like handshakes. It's not long before visitors sprinkle into the casual chats. Hsieh is known to be soft-spoken and a self-described introvert, but when he does speak, it is with a purpose and often in the form of simple, direct questions: "What do you think?" "How old are you?" His poker face is enviable, and he rarely breaks it, unless he can't help but smile -- and then it's a grin that reaches all the way up to his eyes. Tonight, we're headed to "First Friday," an arts-and-music festival that's hosted by the Downtown Project on the first Friday of every month. It's a big deal here, drawing upwards of 25,000 people and stretching nearly two dozen blocks around the downtown arts district. Visitors and some employees of the Downtown Project are shuttled to the festival via party bus. While everyone climbs aboard as the doors open, Hsieh quietly steps away and slips in through the rear hatch of the bus to avoid drawing attention. The giant praying mantis, a metal insect sculpture that shoots flames from its antennae, is a big attraction at First Friday. Arriving at the festival, it's sensory overload. I'm not sure what to pay attention to first. There are fire-juggling dancers, a ballet flash mob hosted by Nevada Ballet Theatre, and row upon row of local artisans showcasing eclectic wares, from purses made of hollowed-out hardcover books -- called "burses" -- to delicate handmade tutus in a rainbow of colors. 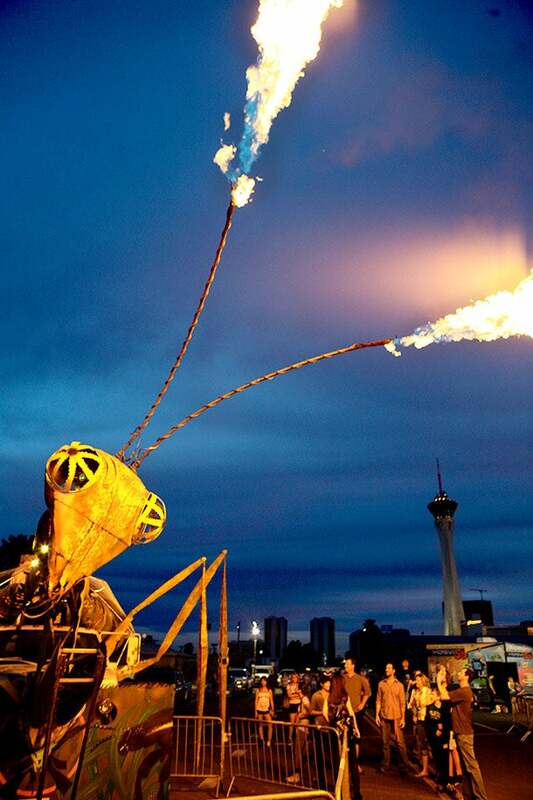 And in the middle of it all is a giant praying mantis, a metal insect sculpture that rises over 50 feet high and shoots flames from its antennae. The festival centerpiece draws oohs and ahs from 13-year-old Sydney, the happy-go-lucky daughter of one of Hsieh's friends. Her father was among a handful of people roaming First Friday with us. The seventh-grader, a creative who dreams of one day being on Broadway, went home with one of the multicolored tutus as a souvenir. The next day when I meet up with Hsieh again, we chat about Sydney and how he's become somewhat of a mentor and big brother to her, encouraging her to be an independent thinker. "That was a pretty epic night, fire-breathing praying mantas, hanging out on the roof of the airstream, ballet flash mob, food trucks...and don't forget the tutus. Yep, that was probably the best night ever." Her excitement about First Friday is at least one example, Hsieh says, of how Sin City is evolving. "Las Vegas was never really thought of as family-friendly, or a place for kids, before," he says, "so the impact First Friday can have on someone in seventh grade is pretty cool."